An underground mine worker at La Mancha Resources’ Frog’s Leg gold mine near Coolgardie was seriously injured in a rock fall yesterday. The company said a rock became dislodged and fell on the 27-year-old man’s legs during routine machinery maintenance. It happened about 7am in an underground section of the mine. “The company’s emergency response plan was immediately implemented and first aid was administered at the scene,” a La Mancha spokesman said. The spokesman said the worker was having treatment at Kalgoorlie Hospital where he had been taken by the on-site ambulance. The Department of Mines and Petroleum said it believed the worker had a crushed foot, broken leg and injured back. Operations at Frog’s Leg were suspended after the accident but were expected to resume last night, apart from at the incident site, providing the company completed a full safety assessment to the satisfaction of the mines department. 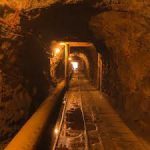 The incident comes after it was last week reported the miner would look to double its workforce in the Goldfields. The expansion will be bankrolled by new owner and Cairo billionaire Naguib Sawiris. About 160 people work at Frog’s Leg, but the miner wants to create 80 positions to reopen its White Foil open pit and 40 positions for its $110 million processing plant, due for completion next year.